Man, I wish somebody would make a worthy modern successor to the Lemmings series. Until then, all we've got is Mario vs. Donkey Kong. 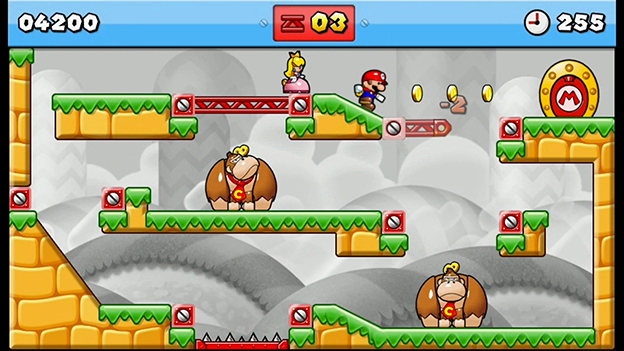 Originally, this puzzle series played out the ancient battle of plumber vs. great ape using miniature wind-up toys, but even that simple premise has mostly been put by the wayside as Nintendo churns out same-y sequels once or twice a generation. 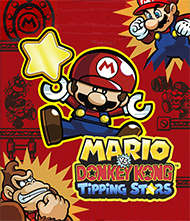 2013's Minis on the Move was a refreshingly novel series entry, but this year's Mario vs. Donkey Kong: Tipping Stars is a return to the same old, same old. Basically, you've got a few wind-up toys based on Mario franchise stars, and they have to navigate a maze in order to get to the exit door. Being wind-up toys, they have no brains and simply walk forward until they hit something, at which point they turn around. Thus, you have to use your stylus to manipulate objects in the maze so they're able to exit safely. You'll have to collect and place jump pads, conveyor belts, and other tools while also ensuring the minis don't fall into spike pits or get clobbered by any nearby enemies. Simply getting your minis to the exit is often quite easy and awards a bronze trophy. 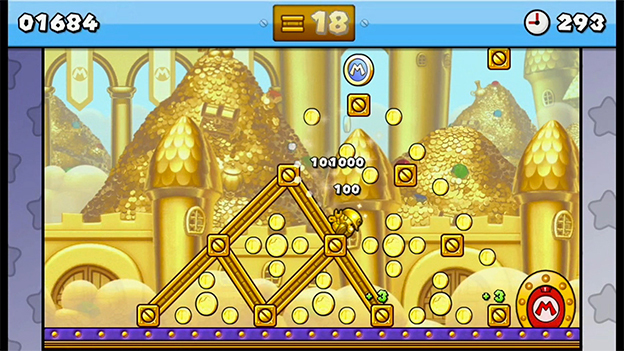 It's more challenging (and the only way for most adults to avoid being bored silly by the main levels) to attempt to collect all the coins scattered through the levels and get your minis to the exit in a timely manner. Doing that awards a gold trophy and extra stars, which serve as currency in the level creation and sharing part of the game. Level creation is clearly the game's focus, as the main levels feel generally uninspired. Most (save a few stacks of bonus levels) aren't very difficult, and there just aren't enough of those joyous puzzle-solving moments when you defeat a challenge and get that satisfying, “click.” Instead, most of the challenge is in tapping or dragging things with a stylus fast enough to carry out the simple plan needed to complete the level. That's not particularly satisfying. I found more entertainment in making and playing custom levels, which is quite simple to do. The level creator provides most of the basics to start, but charges stars for more complex tools like multiple exit doors marked for specific miniatures. The best way to collect lots of stars is to upload a level and hope that other players “tip” you stars to convey their enjoyment. You gain Miiverse stamps by tipping others, so there's an incentive to do so, though I anticipate a dearth of tips as soon as most regular players have completed their stamp collections.